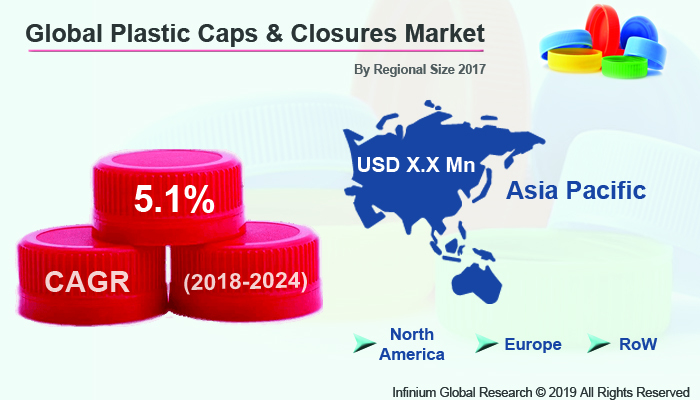 A recent report published by Infinium Global Research on plastic caps & closures market provides in-depth analysis of segments and sub-segments in the global as well as regional plastic caps & closures market. The study also highlights the impact of drivers, restraints, and macro indicators on the global and regional plastic caps & closures market over the short term as well as long term. The report is a comprehensive presentation of trends, forecast and dollar values of global plastic caps & closures market. According to the report, the global plastic caps & closures market is projected to grow at a CAGR of 5.1% over the forecast period of 2018-2024. The plastic caps and closures are designed to meet the requirements of a massive range of products and containers. These caps are suitable to fit a certain type of jar, bottle, or container neck finish as well as the actual material and interior configuration of the closure that may differ to suit with different contents. Variety of different closure types are available that includes a normal screw on, tamper-evident and child-resistant options. These closure types ensure that bottles and containers will stay secure and avoid accidents. Additives are used in plastic caps & closures for high slip performance as well as to improve stability. Caps and closures used in numerous industries such as beverages, cosmetics, chemicals, and pharmaceuticals. Growing demand for packaged food drives the growth of plastic caps & closures market. Increasing food consumption, as well as changing consumer preference for food habits and changing lifestyles are the factors supports to the grow packaging food sector that in turn drives the growth of plastic caps & closures market. Furthermore, increasing consumer preference towards product safety and security, performance restrictions and requirements for sensitive applications such as food and drink boost the growth of plastic caps & closures market. Moreover, the growing demand for plastic caps and closures in the cosmetic industry boosts the growth of plastic caps and closures market. Rising adoption of plastic caps and closures by the pharmaceutical industry for pharmaceutical drug fuels the growth of plastic caps and closures market. However, the availability of alternatives may hamper the growth of plastic caps and closures market. Growing product innovation, as well as brand differentiation, provide beneficial opportunities for plastic caps & closures market. Geographically, In Asia Pacific dominated the plastic caps & closures market. Factors such as increasing consumption of beverages as well as rising population coupled with growth in the food industry that in turn, propels the growth of plastic caps & closures market in the region. The Middle East and Africa region is the fastest growing region for the plastic caps & closures market. In the Middle East and Africa there is a huge diversity of consumer needs for beauty and personal care products that in turn, the cosmetic industry is growing in the Middle East and Africa. Emerging economies as well as growth in the cosmetic industry fuels the plastic caps & closures market in the region. The report on global plastic caps and closures market covers segments such as raw material, container type, technology, product type, and end-user. On the basis of raw material, the sub-markets include PP (Polypropylene), LDPE (Low-Density Polyethylene), HDPE (High Density Polyethylene), and others. On the basis of container type, the sub-markets include plastic and glass. On the basis of technology, the sub-markets include compression molding, post-mold tamper-evident band, and injection molding. On the basis of product type, the sub-markets include dispensing caps, screw-on caps, and others. On the basis of end-user, the sub-markets include beverages, personal & homecare, food, pharmaceuticals, and others. The report provides profiles of the companies in the market such as Caps & Closures Pty Ltd, UNITED CAPS, O.Berk Company, LLC, Coral Products PLC, Closure Systems International, AptarGroup, Inc., BERICAP, RPC Group Plc., Silgan Holdings Inc., Crown, and Amcor Limited. The report provides deep insights into the demand forecasts, market trends, and micro and macro indicators. In addition, this report provides insights into the factors that are driving and restraining the growth in this market. Moreover, The IGR-Growth Matrix analysis given in the report brings an insight into the investment areas that existing or new market players can consider. The report provides insights into the market using analytical tools such as Porter's five forces analysis and DRO analysis of plastic caps & closures market. Moreover, the study highlights current market trends and provides forecast from 2018-2024. We also have highlighted future trends in the market that will affect the demand during the forecast period. Moreover, the competitive analysis given in each regional market brings an insight into the market share of the leading players.